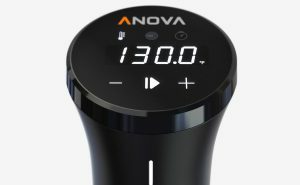 The Anova Nano is the value offering from Anova, it's not as feature rich as other models, but it does have a better price. Power is lower than average. Slightly lower quality than other Anova models. $97.86 Current Price - YOU SAVE $24.19. 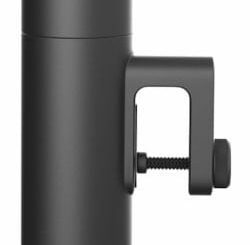 The Anova Nano Sous Vide Precision Cooker is Anova's answer to the lower priced models that started to flood the market. This model is better quality, is more durable and has more features than all of them. This model is best suited to someone looking to get started with Sous Vide cooking and is more of an occasional home chef. If you're a serious cook, you may want to consider the Anova Bluetooth Sous Vide it will be a better investment in the long run. The Anova Nano is smaller than other Anova Sous Vide models at just under 13" tall. The heating tube is made of a high impact polycarbonate material. This choice was made to keep the price down. This model does have an adjustable clamp, however its maximum opening is 0.75", which is smaller than other Anova models. You can stil raise or lower the unit to achieve your desired height, but it's not as flexible as their other models, again this was done to reduce costs. The cord on this model is shorter than we'd like it to be. The quality here isn't as high as Anova Bluetooth Sous Vide but it is better than average. This model only puts out 750 watts of power, making it the lowest powered unit we reviewed. The disadvantage here is that it's going to take longer to come up to the desired temperature. It won't have a problem staying there, there will just be a longer lead time. The flow rate for this model is also slightly lower than average 1.8 GPM (average is 2 GPM). Again this won't really be problem using it, it just affects how long it takes to reach the desired temperature once you get started. The display on the Anova Nano Cooker is fairly easy to read, there is however only one temperature display. Setting the temperature is accomplished by using the +/- keys and then pressing the start arrow button. It's not as easy to use as the scroll-wheel, but again this was a cost cutting decision. If you connect via Bluetooth, you can use the app and you'll find it easier to make big temperature changes. You can set a timer on the unit, but it's ridiculously complex, you should just use a normal kitchen timer or set the timer through the app. Anova was facing a lot of competition from lower priced budget models, so they made some compromises and came up with the Anova Nano. If you're a serious cook, you should step up to the more feature rich Anova Bluetooth Sous Vide, however if you want to try Sous Vide cooking but aren't looking to break the bank to do it this is a good choice. 12.8" x 2.2" x 4.1" 14.8" x 2.8" x 2.8" 11.1" x 14.8" x 4.5"
The Anova Nano Sous Vide is a value priced product from Anova, it's not as feature rich as some their other models but it does have most of the features people want at a budget price. The Chefman Sous Vide is a great choice for someone who's a moderate level home chef or as a great starter unit.